Want your room or apartment to get clean without the use of toxic chemicals? Check out these resources below to learn how to make your own non-toxic cleaners, chemical cleaners to avoid, where to dispose of cleaning supplies. Ammonia. This agent is an irritant and is corrosive and, when inhaled at high concentrations, can cause respiratory damage and failure. It also burns the skin and can cause eye damage and blindness. Triclosan. It is the central ingredient of most antibacterial cleaning products. Laboratory studies suggest that triclosan and triclocarban may be contributing to antibiotic resistance in bacteria known to cause human infections. The Centers for Disease Control and Prevention calls antibiotic resistance one of the most pressing health issues facing the United States. Glycol Ethers. These solvents have been associated with both reduced fertility and sperm count. It typically shows up in glass cleaners. Alkylphenol Ethoxylates (APEs). Categorized as hormone disruptors, these chemicals mimic estrogen when they get into the human body. A scientific lab test resulted in the multiplication of breast cancer cells in test tubes, caused by certain APEs. Monoethanolamine (MEA) and Diethanolamine (DEA). Both of these tend to irritate respiratory tracts. In occupational settings, MEA is known to cause asthma. Phthalates. Categorized as hormone disruptors, high levels of phthalates in men are linked to increased risk of obesity. Boys born to women with high levels of phthalates are at risk for problems with reproductive development in boys. These chemicals are found in synthetic fragrances, a quality of many commercial cleaners. List adapted from the National Resource Defense Fund’s Simple Steps website, where you can find more tips for better health and sustainable living. 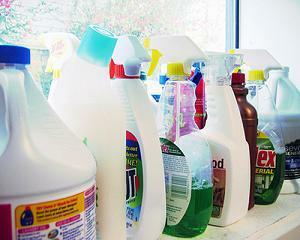 Do you have toxic cleaning chemicals at home that you no longer use? Or perhaps you made your own? Where should they go? Dispose of products at a local household hazardous waste collection center. UCLA has a drop-off site at the S.A.F.E. Collection Center Thursday-Saturday, 8am-2pm next to the Facilities building on Charles E. Young Drive. Use up what’s left, and don’t buy again. If your local hazardous waste site doesn’t accept your leftover household products or you’d rather not dispose of products for which you paid, use them up and recycle the container. Do NOT dump contents down the drain, storm drain, or in the trash; these chemicals are more hazardous to the environment at higher concentrations than in small quantities when cleaning.